Security on the main streets of Hat Yai, Thailand, is heavy. 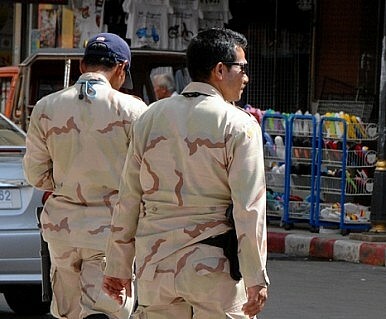 Here, soldiers patrol in pairs, checking for the suspicious, chatting with local shopkeepers and hoping for a quiet day. It’s a scene that is familiar across Southern Thailand, particularly in the provinces of Pattani, Yala and Narathiwat where an insurgency blamed on local Malay Muslims has again flared. Massive car bombings here and in Yala at the end of March, and further attacks in April, claimed 84 lives and injured hundreds more, while strikes that include assassinations and suicide bombings on a smaller scale are now part and parcel of life in the south. Indeed, attacks are so routine that they may not even make the national newspapers. Four local government officials were assassinated in early May while travelling by car in Pattani when gunmen in a pickup truck opened fire with AK-47 and M16 assault rifles. Another 17 people, including 10 female paramilitary troops, were injured in a mid-May roadside bombing while on their way back from guard duties at an annual fair in Pattani. Few seemed to notice. The death toll has continued to mount, with more than 5,000 lives lost since the insurgency erupted in January 2004. The prognosis isn’t good, and differs radically from insurgencies spearheaded by Islamic militants elsewhere in the world, particularly in the aftermath of the September 11, 2001, strikes on New York and Washington DC by al-Qaeda. Al-Qaeda leader Osama bin Laden has been dead for more than a year, while the trial for the last of the Bali bombers, Umar Patek of the now defunct Jemaah Islamiyah (JI) outfit, is all but finished with a verdict due out shortly, marking the final end of a bloody era of Islamic militancy in Southeast Asian history. Yet the problems in southern Thailand persist. A victory by Yingluck Shinawatra and her Pheu Thai Party at last year’s general elections had raised the prospect that meaningful talks on separatist issues in the south might gain some traction despite a long standing contempt for her brother and former leader Thaksin Shinawatra among the local population. From the onset of the rebellion, Thaksin – ousted from power in September 2006 by a military coup – had retaliated with a harsh but ham-fisted crackdown after an initial raid in Narathiwat in early 2004 in which gunmen made off with a cache of stolen weapons. Hundreds of incidents have followed, but two, also in 2004, took local hatred of Buddhist Bangkok to an unsurpassed level. In April of that year, 32 gunmen retreated into the 425-year-old Krue Se Mosque in Pattani after staging a series of attacks on police outposts across the south. After a seven-hour stand-off, Gen. Panlop Pinmanee disobeyed orders and launched an all-out assault on the mosque, the holiest in Pattani. All were killed. Six months later, 78 men died of suffocation following a demonstration and tensions have simmered ever since. The rebellion had taken a lead from the rise of Islamic militancy and terror attacks across the world that followed 9/11 and the October 12, 2002, Bali bombings by JI. But the Thai rebellion was largely classified as a local separatist insurgency.